Everyone! We select destinations for LGBTQ friendliness. Come solo or with friends—you'll be included either way. Up to 25% of our gaycationers travel solo, and we take care to make sure everyone gets introductions. 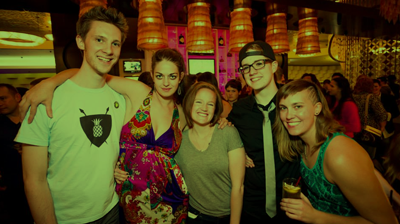 Meet LGBTQs from across the US while you see the sights or simply relax. At over 30,000 members and counting, The Welcoming Committee knows how to engineer events for maximum inclusion and fun. Imagine Vegas in a new hue of LGBTQ, with unparalleled access to shows, pool parties, day trips, and nightlife experiences. A ticket to travel with us includes three nights at the new LINQ Hotel & Casino, a seat at the Britney Spears concert, no-cover club entry each evening, and more. What happens in Vegas? Gays in Vegas!